Before I get to the DIY 3D Pumpkins I must ask – & I know I am really late at saying this but I just finished the series – how bad was that season finale of How I Met Your Mother??? I almost cried from the pain! The night before I finished the HIMYM I kept going on & on to my husband about how wonderful the show was & my desire to own the complete series & rematch it with him… If only a Giustina from 20 hours in the future could have come back in time to warn & prepare me for one of the greatest disappoints of my life – yes apparently I was that emotionally invested in HIMYM. Immediately after watching the finale I texted Roger – who has only seen bits and pieces of the show but loves it – to tell him that I would never ever again watch HIMYM. I didn’t get to see the leaked alternative ending before it was taken off the internet & I am afraid without seeing it we will never own the complete series. But how great is it that Gilmore Girls is finally on Netflix??? Now I don’t have to dig to the back of my husbands gigantic collection of movies to find GG. Seriously though, if you ever want to know how many tests there are in dental school all you have to do is look at my husband’s collection of movies & tv shows. He has a tendency to reward himself by finding a crazy good deal online – which is why I can never find my GG amongst his many movies. So now that I have been devastated by HIMYM it is time that I start the Gilmore Girls series for the umpteenth time so I can have a good laugh & cry with my favorite mother daughter show. 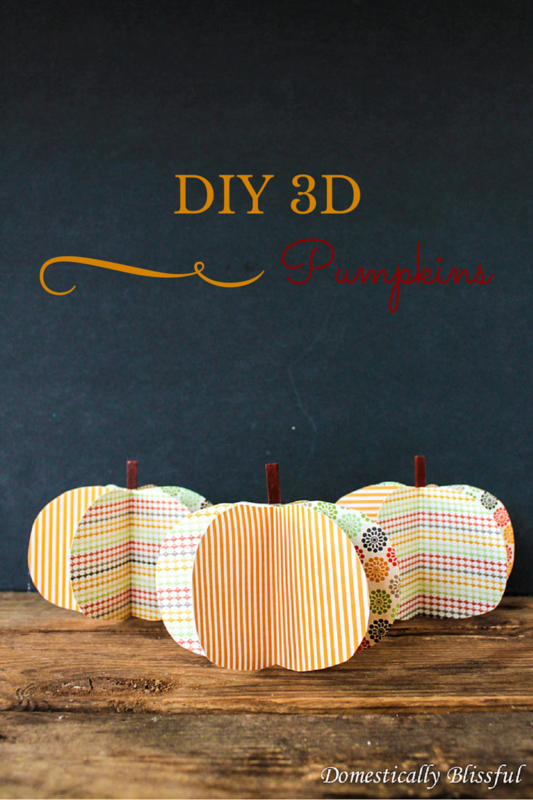 Don’t worry, I am now done with my little rant on HIMYM – I’ll let my husband hear the rest – & will now get on to these cute DIY 3D Pumpkins tutorial! 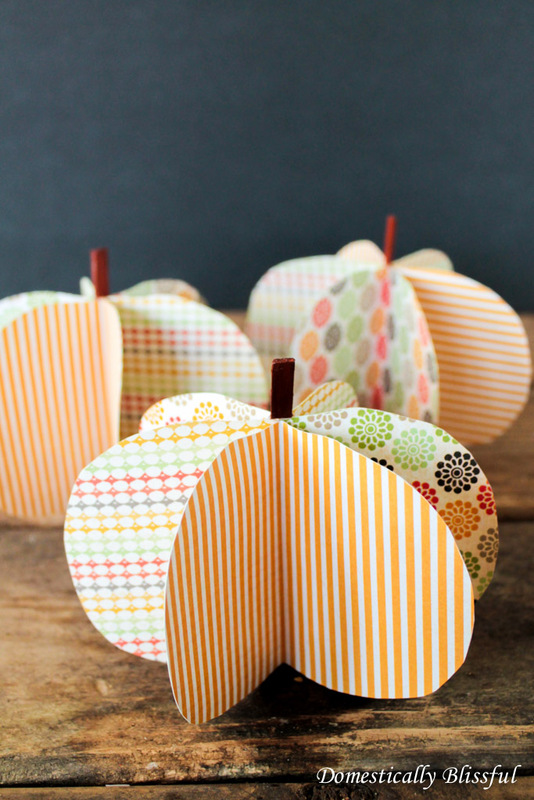 These DIY 3D Pumpkins are the perfect little addition to your fall decor, plus they would make great place cards at your next fall party! 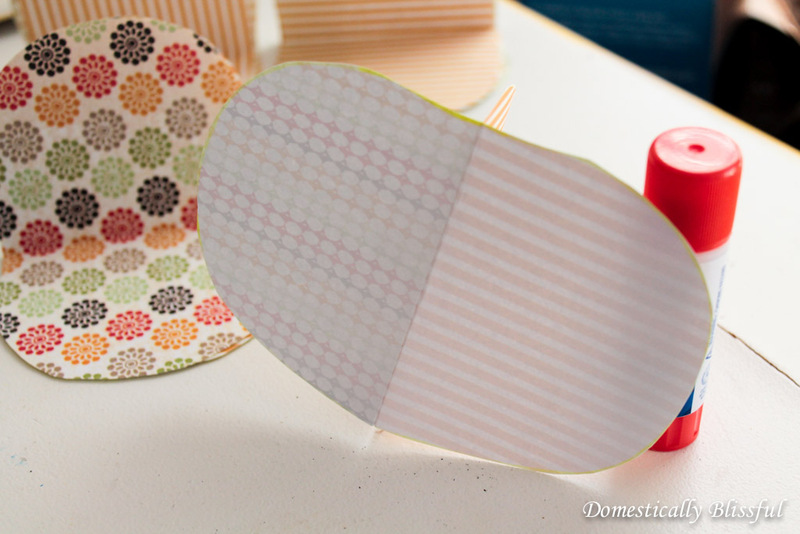 First, print the template on card stock paper, then cut it out and use as a template. 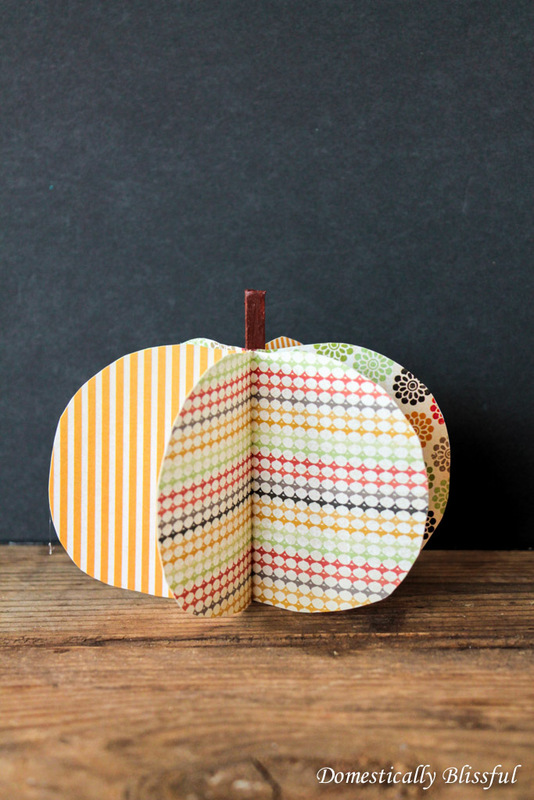 Use this pumpkin template & a pencil to trace the shape on the scrapbook paper and cut it out with the scissors. 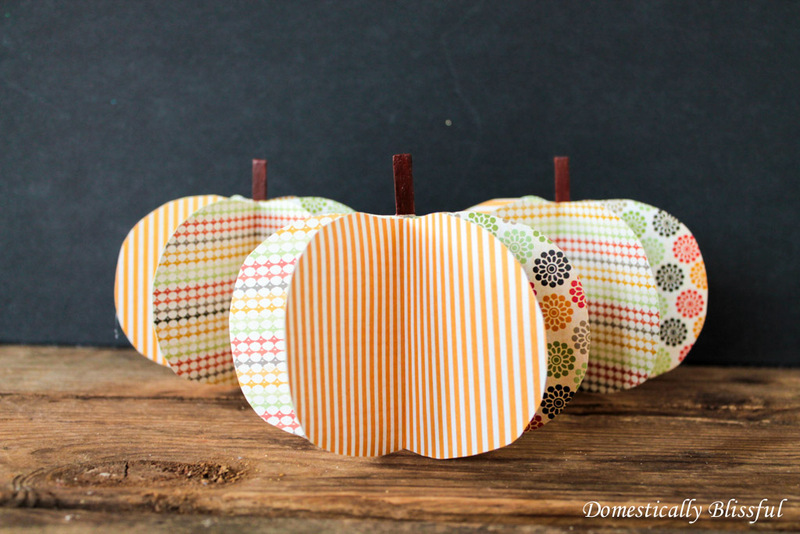 Then fold each pumpkin in half so that the pretty pattern is on the inside. 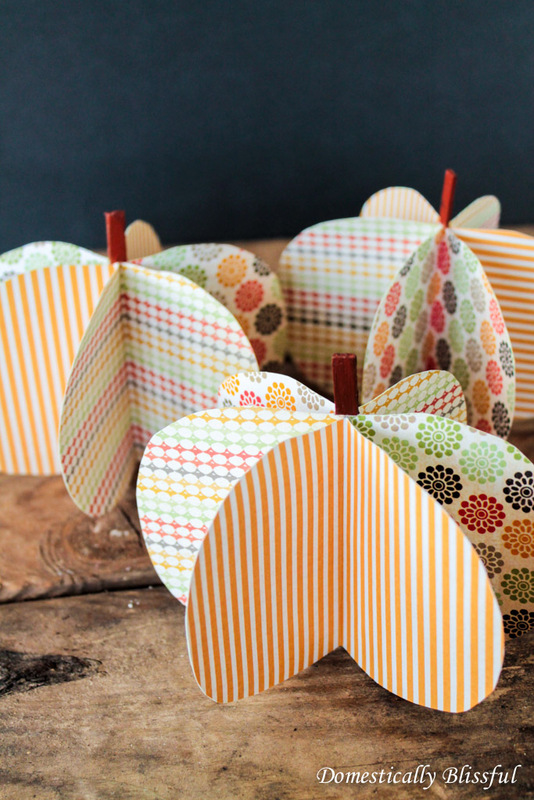 Divide the pumpkin scrapbook pieces up so that there are 6 pumpkin papers for each pumpkin lined up. 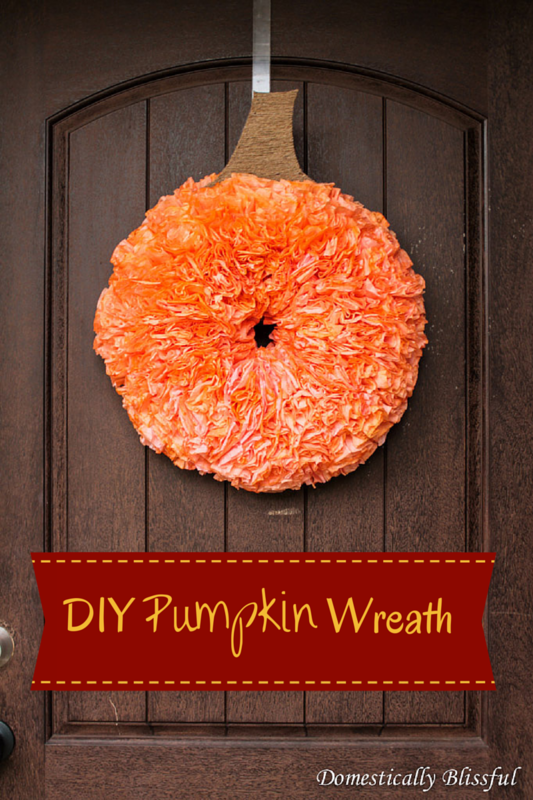 Then take two pumpkin papers and glue their halves together like the picture above. Continue to do this until you have glued together an entire pumpkin. Then continue this process until all of your pumpkin papers have formed 3D Pumpkins. Once all of the pumpkins are glued together trim the edges with the scissors so that there is no white paper showing. There are two ways to glue the stick to the pumpkin. The first is to glue it to the top after glueing all of the pumpkin papers together. The second option is to glue the stick inside the pumpkin before glueing together the last pieces of the 3D Pumpkin. I painted Skinny Sticks with acrylic paint then hot glued them to the top of my 3D Pumpkins. 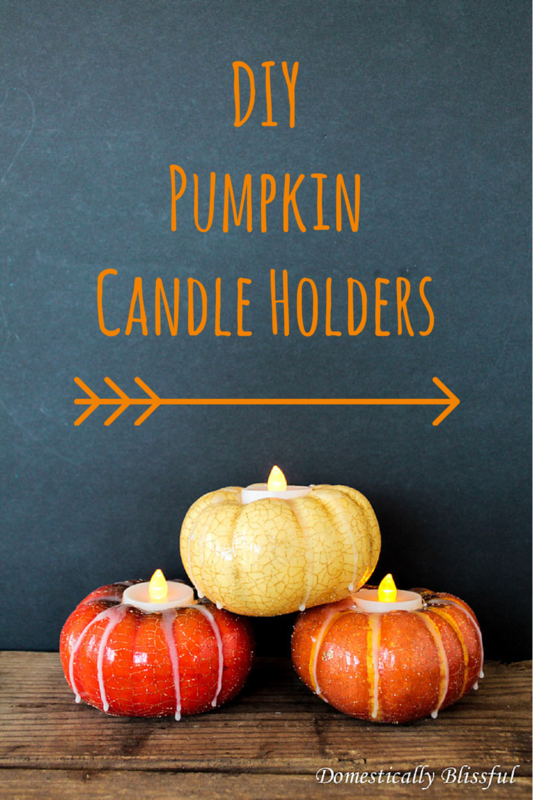 I love that these DIY 3D Pumpkins are so simple & easy to make that they could be a fun fall DIY project for your kids or students. I love the addition they make to my fall decor & that I could personalize them with my guests names & use them as place cards! I’d love to see your DIY 3D Pumpkins! Show off your Domestically Blissful inspired fall decor on Instagram with the hashtag #DomesticallyBlissful for a chance to be featured on DB’s Instagram! 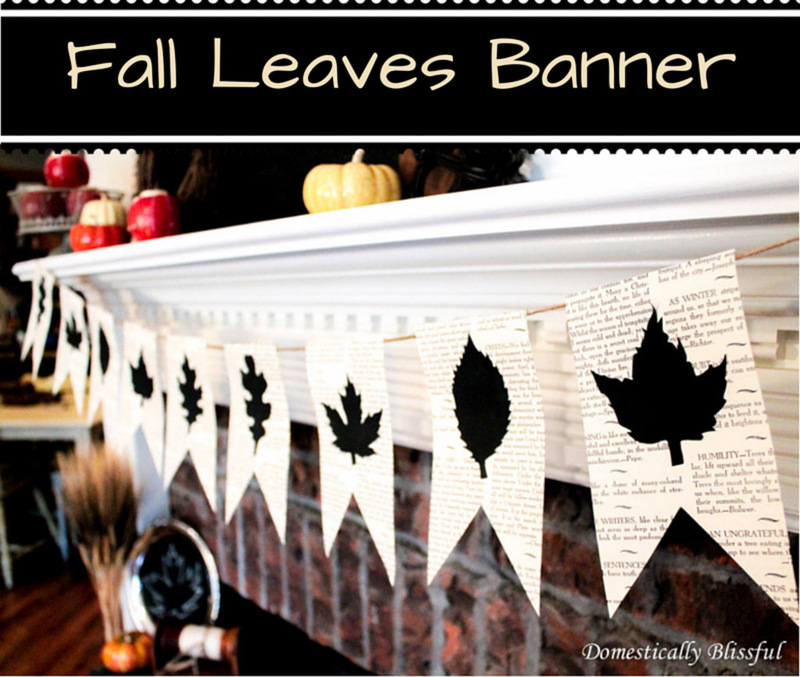 Looking for some more fall decor DIY projects?